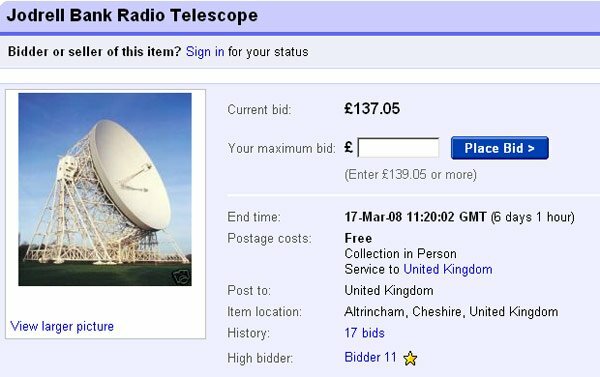 The blurb elaborates: "Despite the fact that $8 million has already been spent on establishing the Merlin Network which links seven UK based telescopes at the centre of which is the Jodrell Bank facility, the plug is being pulled on the project and the assets are being disposed of." We were going to run a light compo to see if readers could come up with a better name for the STFC, but then we overheard some morose boffin in the pub bemoaning: "SFTC? Science-Trashing F**king C**ts. Can you lend me a tenner until my dole cheque arrives?"